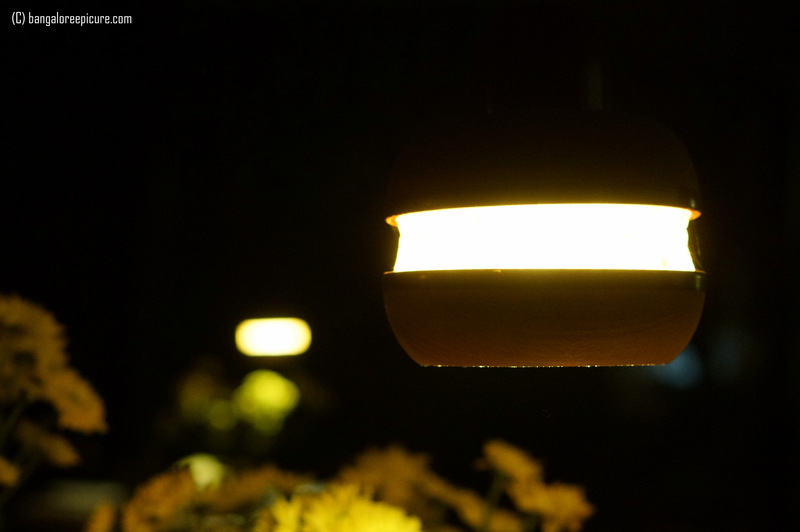 A month before, I happened to visit Grasshopper – A European restaurant through an invitation from a venture to experience the food and service offered by them. 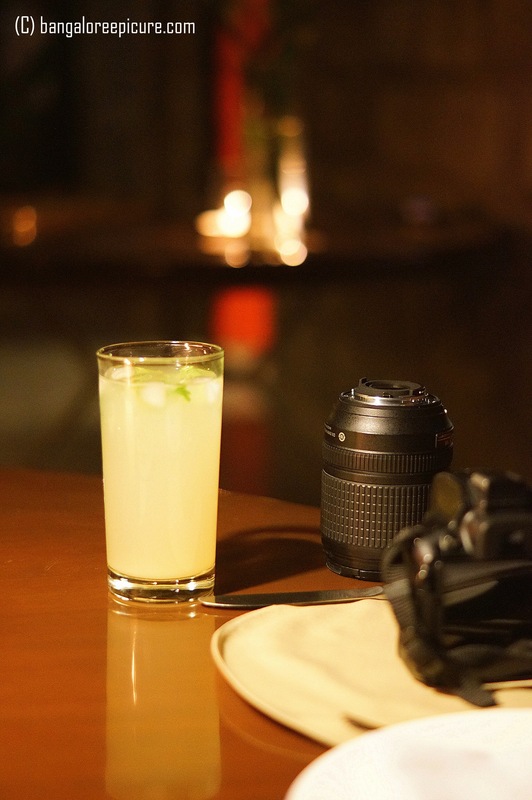 The Grasshopper is located amidst a farm, off Bannerghatta Road. The property is huge and beautiful, one must definitely visit. What kind of food do they serve? As I mentioned earlier, they are into fusion European cuisine. Also, they do prepare food according to guest’s preference. Believe me, they serve delicious and exotic food which brings in million dollar smile. My Experience! Being a Zomato user and strong follower, I wasn’t even known this decade old romantic restaurant until it was listed. Also, I have been seeing Grasshopper in specific category and it was in my bucket list since then. Last month, I happened to visit here along with my friend for dinner on invite from the venture. A day prior, the humble restaurateur Mrs. Sonali called and took my preferences for the food preparation. When we visited, the watchman directed us to park the vehicle and to the dining area. 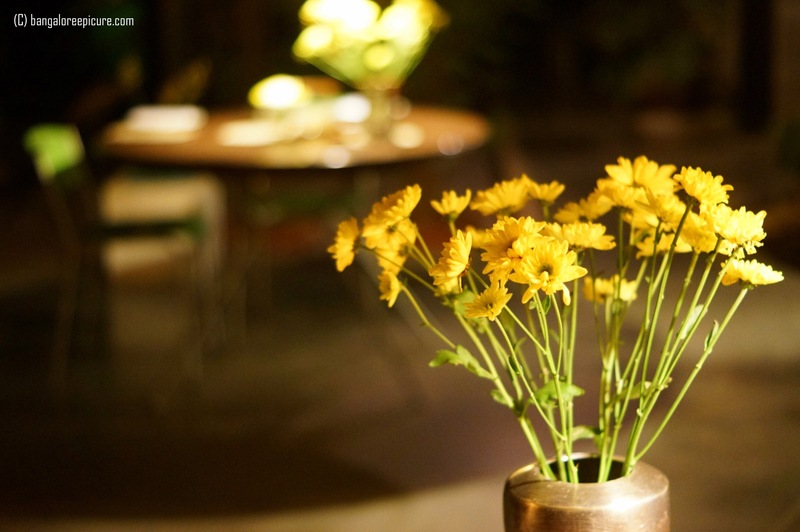 The place was calm with 4 to 5 dining tables with lily’s and some exotic flowers along with candle lights and ceiling paper molded amber light. As we seated, Manager walked in to our table and started explaining about the concept of Grasshopper. They will not allow direct walk-ins. Hence, prior reservation is mandate to dine at Grasshopper. The meal will be 7 course including appetizer, main course and Ice Cream/Dessert which will cost approx. 6000 per couple which might be bomb at first instance. But believe me, it’s worth every penny! More than a food, it’s an experience when you will be at Grasshopper with your loved one. It’s an apt place to propose a gal and celebrate a special occasion with loved ones. A glass of lime juice arrived at our table as we relaxed, it was refreshing and much needed after a long journey to Grasshopper. Well, they have good options for vegetarians too. I totally enjoyed the food served there. What dishes on 7 Course Meal? As I said earlier, they will cook the European dishes according to individual palate and taste. That’s why this place is so popular! I have heard that the quantity of the food is not sufficient at Grasshopper. I would say, it does completely contradict statement. The dishes over here are quite filling and difficult for a normal eater like me. Asparagus with crispy sage and parmesan – Will there anyone who don’t like asparagus? Certainly not in my circle. 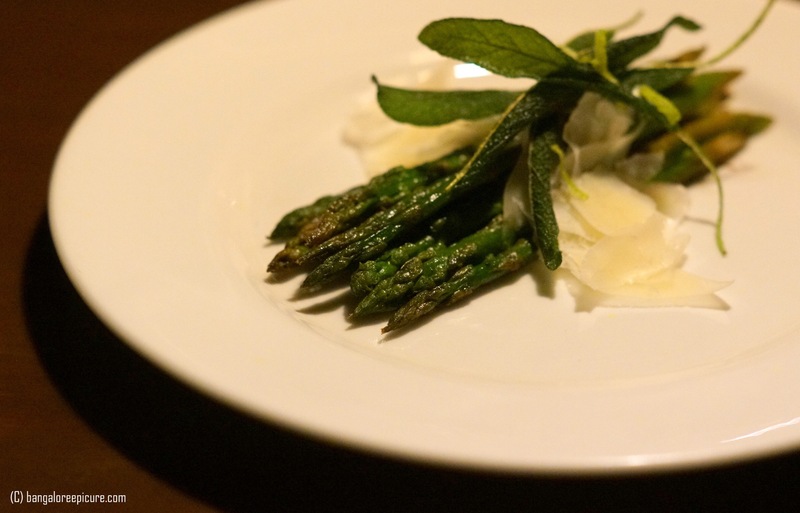 Asparagus were sautéed perfectly and topped with fried sage and garnished with parmesan cheese. The presentation was excellent and combination is fabulous. Believe me, I crave for this dish even now. 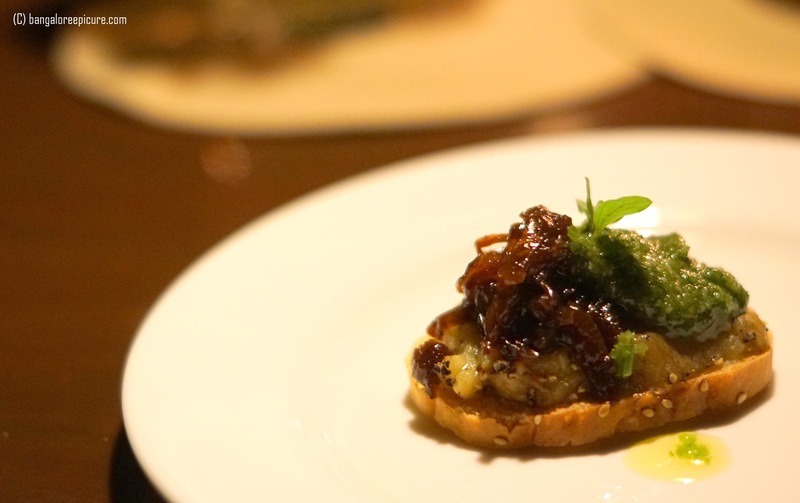 Crostini with Smoked aubergine, caramelized onion and parsley pesto – I have had the crostini’s from different places in Bangalore and other cities. Not sure, whether the authentic crostini will be hard or soft. I always love the soft ones. Here it was soft and aromatic! The crostini was topped with pesto and caramelized onions. This taste just bursts those mild flavors! 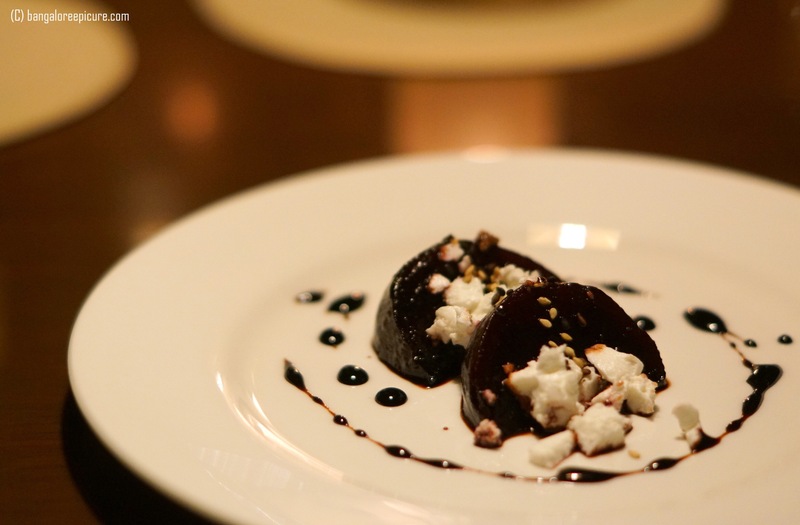 Balsamic beets with feta and sesame – Baby Beetroots were sautéed and tossed in balsamic vinegar and garnished with feta cheese and sesame seeds. The dish is soft, slightly tangy and succulent. 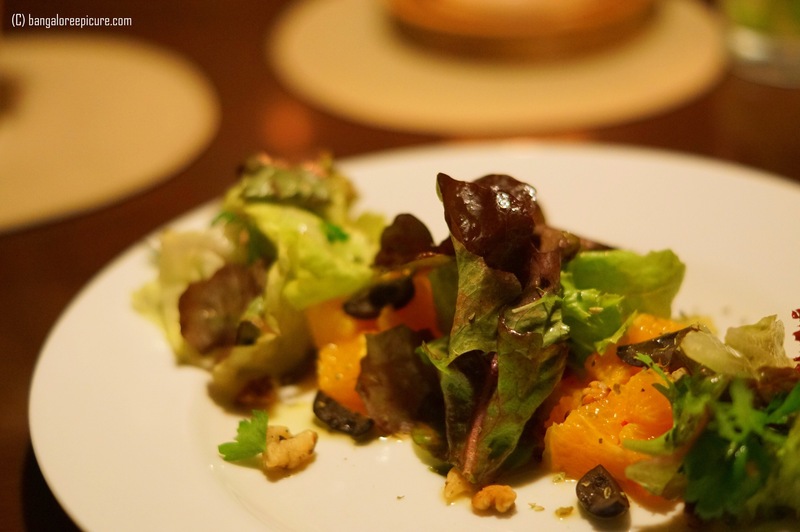 Orange salad with black olives and toasted walnuts – Though I am not a great fan of Salads, this one wasn’t disappointed me! Buttery mushrooms with herbed rice – The dish certainly looks simple with the presentation. However, it is fabulous with respect to taste. 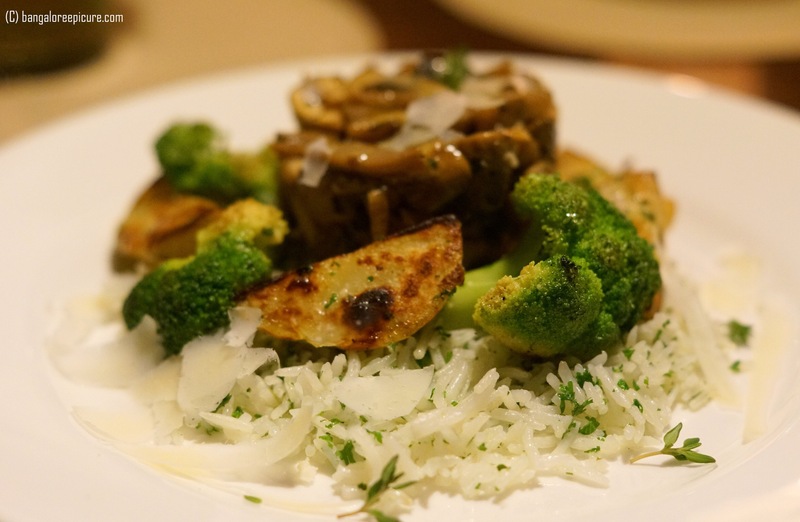 The plate made with herbed rice, sautéed broccoli, buttery mushrooms and fried potatoes. Could have served more herbed rice. Zucchini with minted pea puree – This is a showstopper! 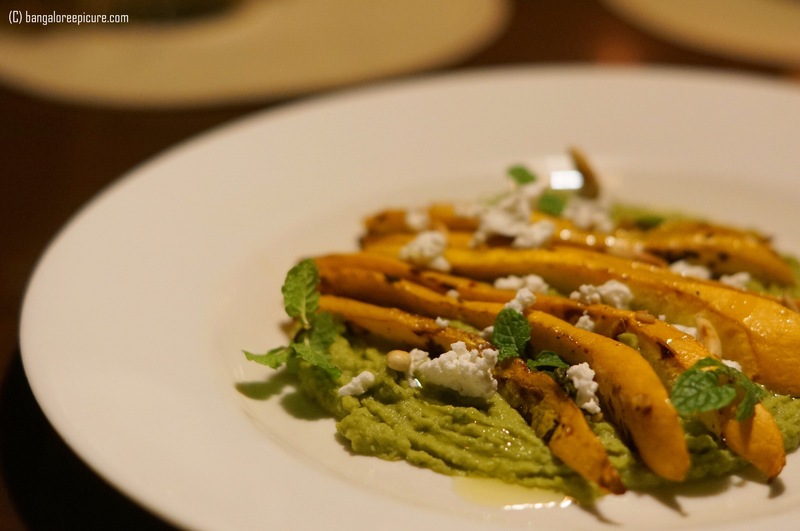 As soon as it arrived on the table, we were flattered with the presentation of vertical sliced sautéed zucchini on the peas puree. The dish was seasoned perfectly! I enjoyed every bite of it. 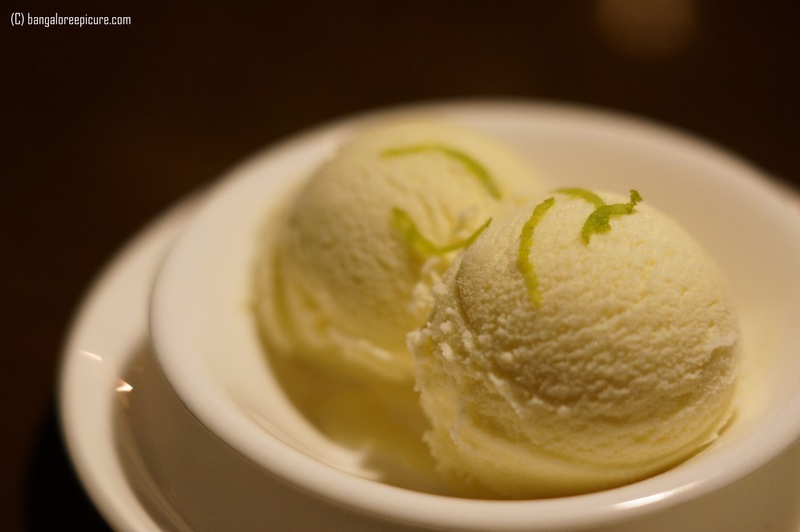 Lemon grass ice cream – In House Ice-cream is definitely must try! They have 4 options and patrons can choose accordingly. Along with these, we also tried other 3 Desserts. These 3 desserts also made in house and the quality and taste are top notch, which cannot be compared with others. The service is deliberately slow. Since this place is to spend some valuable time along with the food. It’s not worth going if you are in hurry. It will take minimum 3 hours and 30 minutes to finish this 7 Course Meal. About the Owners & Place: Sonali Sattar and Himanshu Dimri moved to Bangalore in 1993 after graduating from the National Institute of Fashion Technology, New Delhi. A year later they tossed their clothing label, Hidden Harmony. Their minimal, timeless designs can be found at a few boutiques in India and the UK. 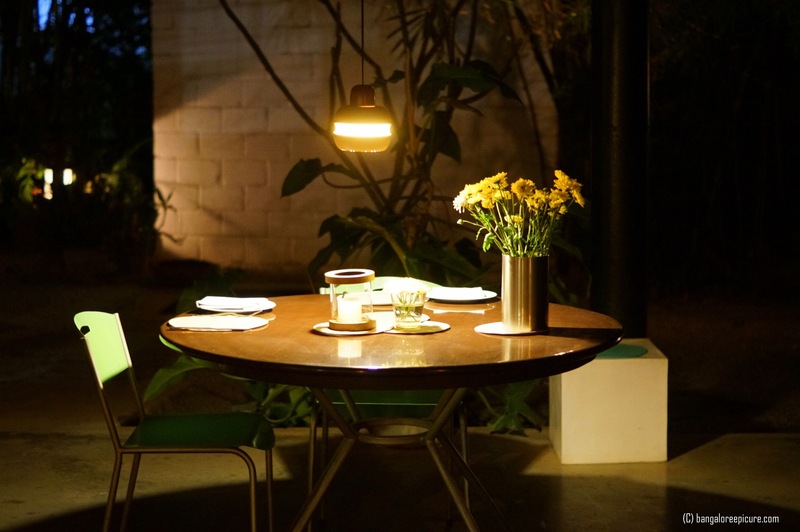 In 2002 they opened Grasshopper, a space that combines design and food, in a building created for the purpose on their farm in the fringes of Bangalore. They live on the farm with their twin daughters and five dogs. Overall, it’s a high end romantic place with subjective food. This place certainly cannot be compared with any other restaurants in Bangalore. Unique would be the apt word for this Grasshopper.